Small rooms in your home or apartment present many design challenges. Probably the most pressing is figuring out how to arrange furniture, accessories, and other elements to maximize the use of space -- without also making the room seem cramped. One of the ways that you can make a room appear larger is carefully selecting paint colors to both highlight the existing space and match the pieces and accessories you have already on hand. Check out our quick guide to how various paint color families will affect the perception of small rooms; as we will learn, sometimes a change in perception will do wonders for your home! Here’s the overall principle to guide you in selecting a paint color for a small room: cooler-toned colors will generally make a small room look larger, while warmer colors will make that same room look smaller. This is because warm, bright colors, such as red and orange, tend to advance in your line of sight, while cool-toned shades of blue, purple and green tend to do the opposite -- and you definitely use the latter to your small room’s advantage. More neutral colors, such as whites, beiges, and pastel shades, can also do wonders to make a tiny room look more spacious! Be sure to use darker shades strategically so you don’t end up making the room feel smaller. Combining colors can be fun, but too many colors may make the room look more cramped. It’s a good idea to limit your new color scheme to one or two hues for this reason. If you’re not ready to paint all four walls with one shade of, say, a deep blue, try an accent wall to change things up a bit; if your other walls are painted in a neutral shade, an accent wall may “open up” the space and make it look larger than it is. Two opposite walls painted in the same color can considerably expand a sense of space. If you must have more than one color on your room’s walls, try selecting monochromatic colors that vary in texture, hue, and shade. This can also be a good way to experiment with unusual pattern choices, such as stripes, chevron patterns, and more. Monochromatic colors can also allow you to play around with some of the “in” paint colors, such as gray shades that vary in hue from neutral off-white, to pearly gray, to wheat-brown grays. While painting exclusively with monochromes may sound boring, the results can be anything but if you take extra time to plan your room’s new look. Don’t discount the ceiling just because it’s high up! As the “fifth wall” of a room, a ceiling can be painted to make a room look a lot higher than it actually is -- to increase the appearance of height, try painting your ceiling a neutral beige or brown and leaving the other walls as they are. 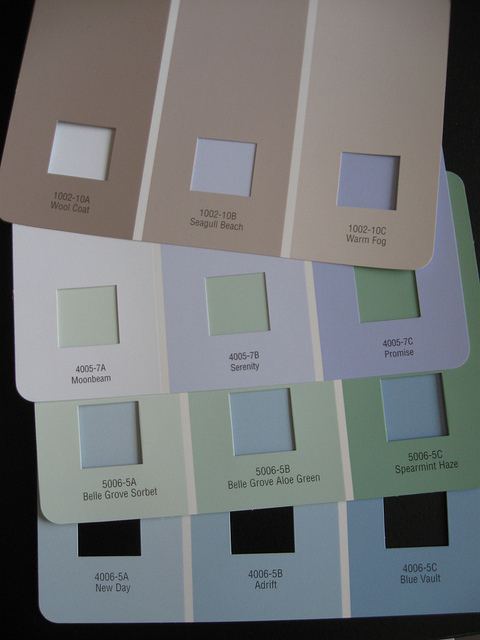 If you’re keeping your ceiling white while you paint your walls another color, however, remember to keep in mind that the color(s) you paint the walls will cause changes in how the light hits your ceiling -- and the ceiling’s color. For the best-looking results, hire a professional painter to make the most of your small room.